Photo courtesy of GREY2K USA. It's hard to imagine that there are some parts of the world where greyhounds have it worse than they have it here in the United States, but Macau is one of them. 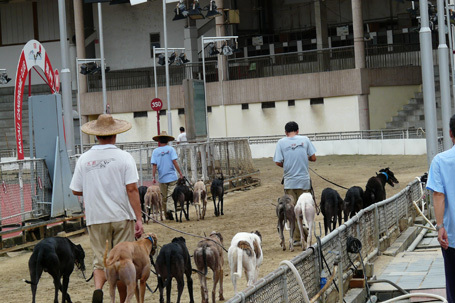 Many dogs from Australia end up on the peninsula of Macau at the Canidrome where they don't have a chance at life during or after racing. 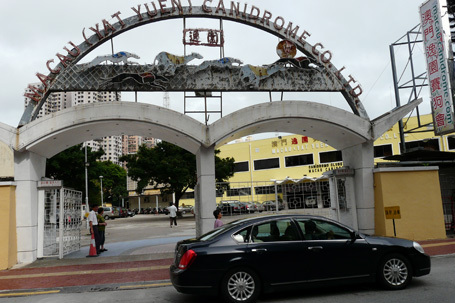 The Canidrome was built in 1931 and is a run-down track. Dogs are kept in small cages stacked two high when they are not racing and many sustain injuries on the track while racing. If a greyhound does not finish in the top three in five races in a row, they are destroyed. It is reported that around 400 dogs are killed by lethal injection each year and every greyhound arriving at the track is dead within three years. There is no adoption program at the Canidrome. Every dog that goes there, dies there. What can we do to stop this barbaric cycle? We can collectively inundate them with mail to let them know we are not happy with Australia or China. This practice is a black eye on a country like Australia, a place we usually think of as a wonderful country. Up until Australia started their greyhound adoption programs a few years, all of the greyhounds there were killed. Their laws, unless they have recently been changed, still require all greyhounds to be muzzled at all times unless they have a particular colored collar on. We all know these dogs don't need to be muzzled! Please write to Australia’s Minister for Agriculture, Fisheries and Forestry and ask him to stop the export of greyhounds to Macau and to Macau’s Chief Executive asking him to close down the Canidrome.